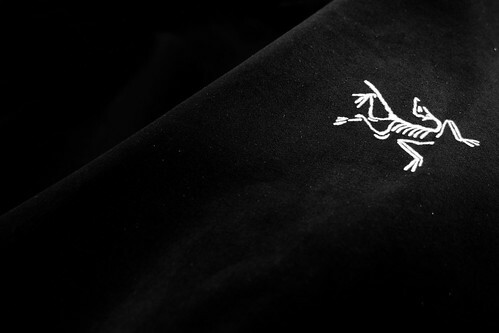 New for S/S 2015, Arc'Teryx launched a new line of apparel aimed at cyclists. More specifically at the urban cyclist and commuter. While technically part of the shell jackets category in their 24 line of urban directed apparel, think of this as Arc'Teryx taking their quality and engineering approach for mountaineering and alpine sports and bringing it to the bike. The flagship piece for this new line is the A2B Commuter Hardshell. I've put many months, miles, rides, and trips into this jacket. Both on and off the bike. This jacket has been with me through the grind of commuting and even used on foul weather cycling rides with the club in temperatures hovering at the freezing mark. The following review is based on my experiences with this jacket over the current season. Click any of the pics from this review to open them up in a larger lightbox. I first caught wind of the A2B Commuter Hardshell last winter and was really interested to see it in person. When it arrived I was first impressed with its overall design and how it fit right with my expectations. I quickly noticed when putting it on that there is the clear difference in its feel compared to most other pieces from Arc'Teryx. This is due to it's 'trim fit' which I detail below. 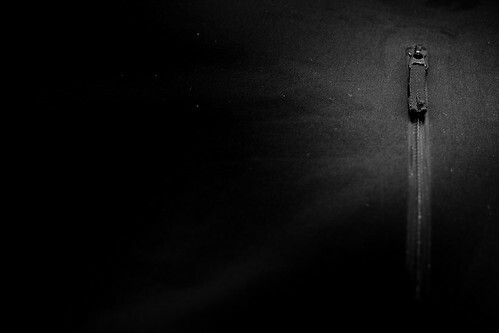 The usual level of Arc'Teryx quality and craftsmanship was obviously apparent. A lot of thinking and refinement has gone into creating this garment. All of the expected features of a good cycling jacket are there. Nothing less, nothing more. So the jacket felt great when I put it on and I was excited to get on the bike and get going. The A2B Commuter Hardshell is very understated which adds to is versatility as a piece of casual apparel. While it is packed full of features you need, they are all very well designed and work together in harmony rather than competition. Reading through the product descriptions on their page you'll see that a lot was put in to this jacket but for this review I'll focus on more of the bigger details. But what does 40 denier mean and is it important? Yes it is important. Denier is a unit of measurement used for the size and mass of a fibre thread. The full definition is here. Simply put, the lower the number the more fine (or thin) the fibre is. 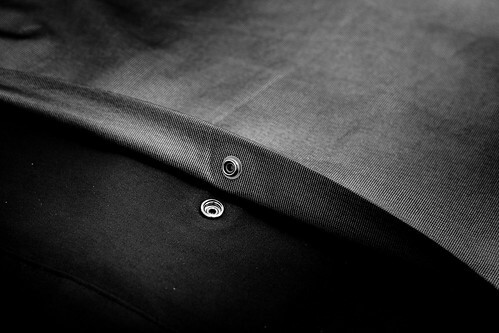 In general, lower numbers have a softer feel and a more sheen appearance because there are more fibres per square inch. Higher denier fabrics are stiffer, firmer, and tend to be more abrasion resistant. Arc'Teryx has a great fabric chart online which outlines at a high level the differences of each textile they use. Check it out here. While N150 is the highest denier on their current chart, N30 is the lowest. So that puts the A2B Commuter near the softest of their GORE fabrics. How would I describe the jacket? Softer in feel but surprisingly stiff. More akin to N70 but without being brittle or coarse in feel. All of the zippers are WaterTight (highly water resistant, not waterproof) YKK zippers. The front zip is obviously a full zip. 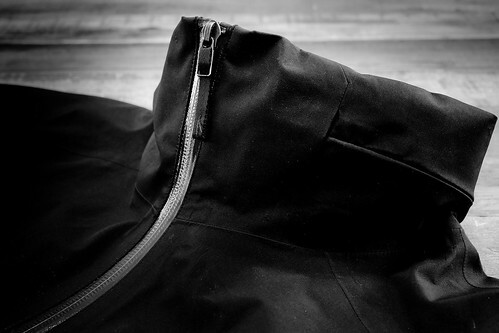 The hood is secured behind a smaller YKK zipper. A detail here that I do love is that not only is the hood zipper well hidden behind what looks like a natural seem, the zipper pull itself is stowed behind a flap when not in use. 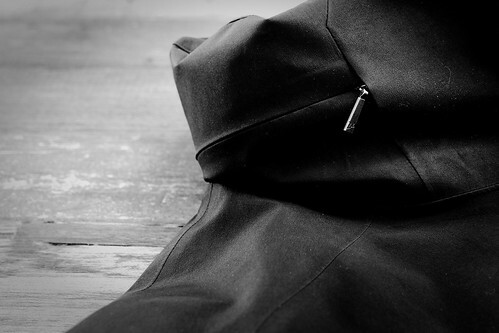 The pocket configuration of the jacket consists of two front pockets, one rear pocket, and one internal chest pocket. The two front pockets are well sized and well positioned. They've always felt well positioned and ample to carry just about anything. 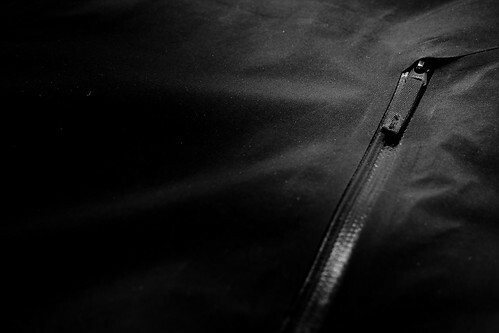 The rear pocket is located on the back right of the jacket and zips downwards for entry. Why does that matter? Well because it's easier to unzip the pocket down with one hand than it is to unzip it upwards. This really helps when you need to grab something while trying to stay in control of a bike. The rear pocket is sized nicely to fit your cellphone, food, or any small items you may want access to but don't want weighing down the front of your jacket while cycling. 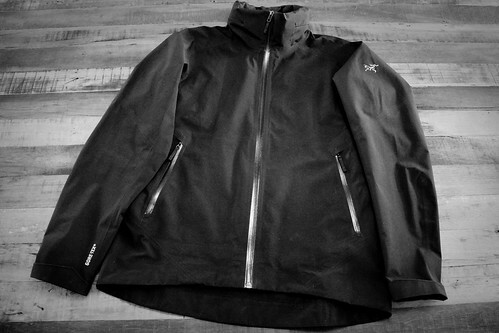 The A2B Commuter Hardshell includes what Arc'Teryx calls a StowHood. This is a low profile hood that fits under the helmet without restricting movement or peripheral vision. This is important as it helps keep you completely dry in foul weather without sacrificing your field of view when it's already going to be limited. From my experience the hood does fit and work well and being under the helmet means the hood catches a lot less wind and rain inside. However, hoods that fit over your helmet keep your helmet dry which say if you're riding in the rain in the morning means you won't have a wet helmet to ride home in later. Each has the advantages. 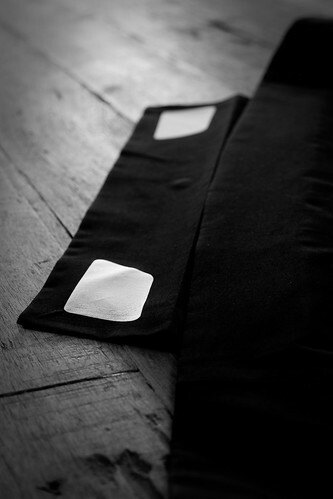 For visibility, Arc'Teryx has added reflective patches on the sleeve cuffs and on a tail extension on the back. 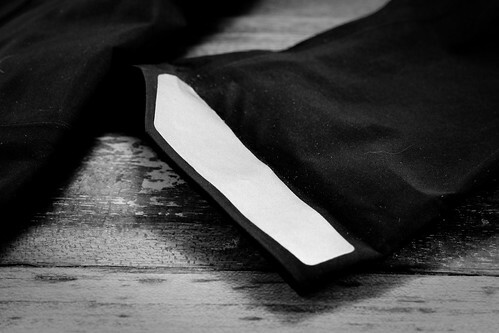 The sleeves have a cuff that can be rolled down to exposure large patches of reflective ink. Good for helping you be seen to anyone from the front. On the back there is a small flap that is stowed inside the jacket by a small button tab that can be dropped down when riding. This has two small reflective in patches to help you been seen from behind while riding. While the reflective ink could be larger and use the whole tail space, it's seems to be noticeable to lights behind you reflective ink should never be used in replacement of good lights at night. The A2B Commuter Hardshell is derived from Arc'Teryx's 'Trim Fit' design. They describe this fit as trim and motion friendly with lower volume to reduce bulk. What does this mean? The trim fit feels tailored but never restricting and with help from the articulated patterning it really does move with you. Of their fits, this seems to be their newest but most sensible for urban uses. One thing I did notice however is that this fit is more snug across the chest than I would prefer. It's not overly snug but it does make it harder to fit over thicker base layers or tops in cooler weather. More of a problem in casual use than commuting. The sleeves are generous in length and that articulated patterning seems to strike a great balance between a natural riding position on the bike without feeling awkward for every day use. The overall front and back lengths are quite good. Again they've found a great balance between what works while riding or running errands. There is never a sense of too much fabric in the front that bunches or binds while riding. The extended tail not only adds extra visibility but also some wet weather protection from tire spray. Importantly the back is not so long that while off the bike you look like you're wearing a cycling jacket. The mid-height collar is quite close fitting when the jacket is fully zipped, especially if the hood is stowed. Why is this? The added bulk of the hood when stowed makes the collar thicker in turn which leads to a snug fit. However it also helps keep the collar taught and upright. I appreciate this because it not only makes the jacket look better but also easier to zip one handed. 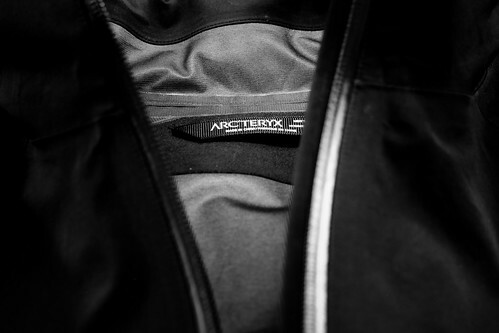 Branding on the A2B Commuter Hardshell is quite minimal which is what you expect from Arc'Teryx. It's not as minimal as apparel from the Veilance line but it's still never bold or brash. The jacket has two highly visible brandings on it. 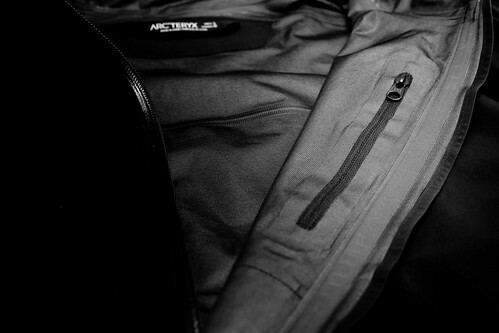 There is a reflective ink Arc'Teryx logo on the upper left sleeve and a reflective ink Gore-Tex logo on the lower right sleeve. 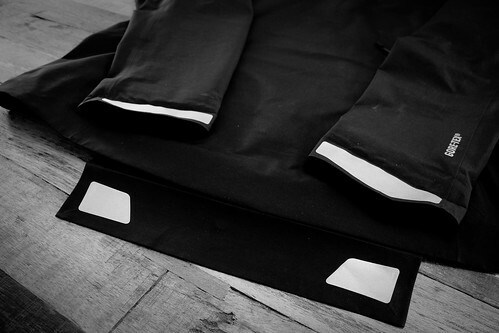 Inside the jacket there is a small and discreet logo and article detail on the collar tab. I've got one nit to pick about this jacket... venting. Or the lack there of. Cycling is a physical activity whether it be leisure, sport, or commuting and so your body temperature is going to rise. The only relief is to open up the front zip and let air in. Since there is nowhere for all that incoming air to escape, the jacket balloons out. If I could ask for one change in any future revisions it would be to add vents somewhere. Whether it be on the arms, under the arms, with zippers, or with mesh. Just something to help regulate body temperature. I know this may compromise the water resistance but it will make it more functional on the bike. Here is my advice in one sentence. This is one hell of a jacket and it won't disappoint any level of expectations. If you've got to go with one jacket that will cross over from the bike to the street, the A2B Commuter Hardshell should be at the top of your list. Honestly I really can't tell if this was a cycling jacket designed to work well off the bike, or if it was a casual urban jacket designed to also work well for city cycling. It doesn't matter because it's great for both. With some rethinking, I would love to see Arc'Teryx continue this bike friendly trend and bring a version of the A2B to road cycling. In the fall of, 2018, I had an unfortunate user error based incident with this jacket. I had left the rear pocket unzipped and it got caught on a door handle while locking my front door. When I turned around to leave, the handle pulled on the jacket and tore a good 6-8” hole in the back exterior panel of the jacket. Heart broken! But this is where the story gets better, and a big reason why I’m a huge fan and advocate for the Arc’Teryx brand. I took the jacket into a local flagship store for a repair request. (Important, not a warranty request because it was not a defect) The store staff was helpful and took my information and my jacket before sending it to Vancouver to their head office for inspection. They received it in late October, assessed it in early December, repaired and returned it to my house in early January. Right in line with the 3-4 month estimate they gave in store. To repair the jacket, Arc’Teryx gave me two options after the detailed inspection. I could either repair half the back panel or replace the whole panel. A cost difference of $20 but it would look as new and no new seam lines. I opted for the full panel repair. Happy to report that it looks brand new and for a total of $80 including shipping, I have one of my favorite jackets back, kept it unnecessarily out of a landfill, and saved a bunch of money. Which I can use on a trip or new gear. Standing by your gear and helping keeping it lasting as long as it can is a big part of the positive Arc’Teryx value proposition. Remember, they did this on a product they don’t even sell anymore.